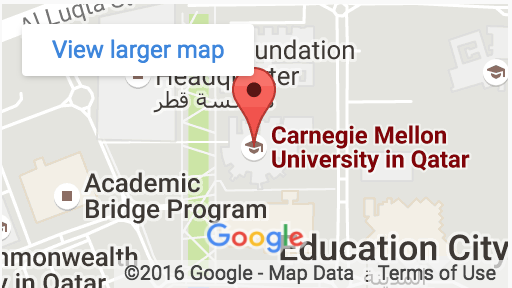 Students at Carnegie Mellon University in Qatar, regardless of program, are exposed to real-world problem sets throughout their education. This summer, 46 students used those practical skills to gain experience in the workplace through internships. Nine students shared their experiences with fellow students at the CMU-Q Internship Showcase, the first held at CMU-Q. The forum was an opportunity for students, particularly freshmen and sophomores, to learn about the importance of internships in a Carnegie Mellon education. “CMU-Q prepares you really well for doing an internship, because you have all the basic knowledge. For example, CMU-Q taught me a lot about design thinking as a foundation for solving problems, and it turns out that McKinsey uses design thinking for their brainstorming solutions,” remarked Ibrahim Soltan, who interned at McKinsey and Company. The students emphasized the hands-on nature of their internships; several made significant contributions to the companies where they worked, developing business plans, rewriting code or conducting biological research. Also presenting at the event were Farjana Salahuddin (Ooredoo), Yaseer El Sayed (Meddy),Sherif Rizk (United Development Corporation), and Asma Al Naama and Reem Hasnah, who also interned at QBRI.